According to Exodus chapters 20 and 24, Moses set up an altar “at the foot of the mountain” after writing down God’s Laws in the Book of the Covenant. The altar was for burnt sacrifices and peace offerings of sheep and cattle and must be constructed without steps, and without cut or chiseled stone. The altar was constructed at the foot of the mountain, along with 12 pillars representing the 12 tribes of Israel. After Moses ordered the sacrifices to begin at the altar, he took half of the blood and threw it against the altar. The other half was placed into bowls. Moses then read the Book of the Covenant (God’s regulations that Moses wrote down) to the Israelite people, probably from a higher location that is more fitting for speaking to a large audience. After being told about God’s regulations, the people agreed to the covenant with God. Moses took the bowls with the blood and “threw it over the people,” presumably referring to the 12 pillars representing the cumulative population of the 12 tribes. There is evidence of these events at the foot of Jabal Maqla that remains there to this very day. We had the opportunity to explore these ruins during our trips to the site. This L-shaped structure clearly resembles chutes, which would be required for lining up the animals for sacrifice. At the end of the line, there is evidence of burnt sacrifices and various features required for the Exodus story to take place. It is an earthen altar, does not have steps, and is made entirely of uncut stones, an anomalous design among most man-made structures. One end of the altar has a pit with layers of ash; this is likely where animal sacrifices would have taken place. The Saudi government’s researchers who briefly excavated the site, apparently with the purpose of debunking the alleged connection to Moses, had to concede that ash, animal waste, bones, and charcoal were found while digging 3-4 feet at the site. The topography of the location is also fitting for the story. The Books of Exodus and Deuteronomy state that there was a brook (a stream) that came down from the mountain. At Jabal Maqla, it is easy to see where water came down from a higher spot on the mountain. The stream-bed comes down from the mountain right next to this altar site. The brook is accessible from the section that may have been the slaughter platform. If the Israelite priests needed to wash or dispose of waste, the topography of the land and layout of this structure would enable the priests to easily step down to the stream to dispose of waste, to wash, and then return back to the platform. The walls of the animal chutes are roughly three feet high. They may have been higher many centuries ago, but Dr. Lennart Möller’s examination found no sign of the walls deteriorating, as there are no stones scattered about. Ryan Mauro stands in the middle of the altar at the foot of Jabal Maqla. 12 Pillars or Remains of Monument? Next to the structure, there are purposely-created circular stones that may be the pillars described in Exodus 24, or the foundation stones for those pillars. They were made from a small marble quarry higher up on the mountain. According to Jim and Penny Caldwell, an American couple who lived in Saudi Arabia and repeatedly visited this area in the 1990s, the pillars resemble the arrangement of the 12 circular stones in the ancient Israelite High Priests’ breastplates: three rows of four, according to Exodus 28. Approximately 10 of these pillar stones remain today, each of them measuring about 23 inches in diameter. They vary in height, ranging between 8 and 26 inches. The Caldwells’ theory is that the height of the pillars may have corresponded to the size of the Israelite tribe that it represented. The pillars may have had bases or sat in a square-shaped platform. There are rectangular-shaped marble pieces around the circular pillar stones and many chips of marble. The rectangular pieces are about 18 inches in diameter. Jim Caldwell has suggested that the 12 pillars were within a 20×20 foot square-shaped foundation. Around the area are chips of marble. It is possible that the chips are from the initial creation of the pillars. It is possible that the chips fell down from the quarry above due to seismic activity, but it’s also plausible they are the result of vandalism over time damaging the pillar site. How the structures got to be in their current state is unknown. Some proponents of Jabal Maqla as Mount Sinai believe these are not the 12 pillars, but rather they are the remains of a monument commemorating the Exodus events. This opinion is based on a couple of local Saudis reciting a tradition that Solomon had a structure erected at this location. This may be an inaccurate tradition or a miscommunication. Our experience has been that the local Saudis speak very little English, resulting in frequent difficulties and misunderstandings when describing events and objects. The claimed-tradition is also apparently not universal among the local Saudis, as one told us that the marble pieces are the remains of a “house” for Moses. The book of Exodus reports that Moses read the Book of the Covenant to the Israelite people from this location at the foot of the mountain. They were able to audibly hear him enough to agree to the covenant’s stipulations. This would likely require an accessible platform that is higher up on the mountain in the front so that the Israelite population could see Moses. In addition, the shape of the area must magnify the sound of his voice for the population (or at least the leaders of each tribe) to understand the regulations and respond. Saudis who believe that this is the altar constructed by Moses emphasized how the sound echoes like an amphitheater, reflecting a tradition that Moses addressed the Israelites from higher up on the mountain above the possible altar. This small platform sticks out in the front like a stage and is distinct enough to be easily located from afar. Locals often point to this spot to identify Jabal Maqla from other peaks within the Jabal al-Lawz mountain range. It has also been suggested that this is the “cleft in the rock” where Moses received the second set of tablets with the 10 Commandments. He broke the first set in anger upon seeing thousands of Israelites worshiping the golden calf. The Saudi government has forbidden visitation of the possible altar and pillars. They have not explained why access to the site is forbidden and why, if it is insignificant, outside experts have not been permitted to examine it with supervision. The most logical paths to the site are blocked off with a fence and a warning sign. A police station is in front and the area is patrolled. The patrols are known to approach those who are headed to the fence and to follow those anywhere in the vicinity. In the Saudi government’s rebuttal, they claim that the man-made structure is from the Nabataean Period and was for housing quarry workers. The Saudis claim that the workers were using the marble to make pillars to export to Petra for sale. They did not explain why the current artifacts were left behind. The Saudis’ explanation that this was a commercial quarry is simply not substantiated by the evidence. The spot with the marble quarry is too small and difficult to access to justify such a massive investment in time, money, and energy. The man-made structure does not resemble the remains of a structure or any living quarters for human beings, as the Saudis also claim. Accessing the marble quarry requires a climb very high on terrain that would be difficult for animals to walk, especially if they had to transport heavy marble, or people and supplies. 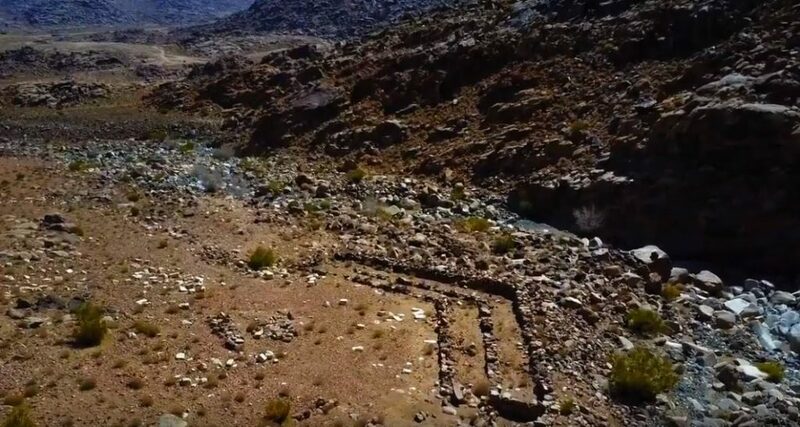 The Saudi archaeologists in the Al-Bid’ study state that there are two quarry spots, one at 2,400 meters above sea level, and another at 2,500 meters. The archaeologists found that there was little evidence of mining at the lower quarry and that the higher quarry appears to have been used for a very short amount of time. The team also found at the higher quarry cylindrical and circular marble stones that were almost identical to the ones next to the altar at the foot of the mountain. Why there are these cylindrical stones still up on the mountain is unknown, but the Saudis admission that this quarry was only used for a short time lines up with the Exodus account, where the Israelites were at Mount Sinai for a fairly short timeframe. One important thing to note is that there are more accessible and larger quarries in the area. In addition to being a poor investment for the hypothetical quarry business, this site would also be unnecessary for such an endeavor. The Saudis seem to be deliberately deceptive in making their case. In Al-Bid’ (History and Archaeology), the archaeologists claim that there are remnants of a paved track up to the small quarry that is higher up on the mountain, which they claim is about 10 feet wide. Those who have carefully examined the entirety of Jabal Maqla have found no evidence of such a track nor any path to the quarry that could be a road. The Saudis have inexplicably failed to provide any photography, videography, or clear directions to verify their assertion. The pictures of this “track” in Al-Bid’ do not appear to show the alleged remains. The Saudi government’s archaeologists who briefly evaluated the site and publicly rejected the notion of a link to the Exodus story claimed to have found pottery in the altar-like structure. Jim and Penny Caldwell previously dug at the site and never found the pottery that the Saudis’ claim to have found relatively easily. Nonetheless, it is not uncommon for pottery (and other artifacts) from different eras to exist in a single site. This happens as different peoples visit a location or live in a location over periods of time. But just because there are allegedly some Nabataean artifacts at this spot, it does not mean that the structure was constructed by Nabataeans. One objection to the theory that these pillars were erected by Moses and the Hebrews because these pillars are clearly made with tools. This objection is maintained by Egyptologist David Rohl, author of Exodus: Myth or History? The twelve pillars’ (Hebrew massebah) found by Wyatt at the foot of Gebel el-Lawz… are of ‘hewn stone,’ chiseled and smoothed. This goes against Mosaic law and earlier patriarchal custom [Genesis 28:18, 31:45 & 35:14] which requires massebeah and altars (Hebrew mizbeah) to be natural stones untouched by chisel or the strike of a hammer. David Rohl, Exodus: Myth or History? (Saint Louis Park, MN: Thinking Man Media, 2015), 396. At first glance, this appears to be a legitimate objection, but when further analyzing the prohibition on using tools for certain structures, the Biblical text specifically refers to altars (Hebrew: mizbeach) and not to other objects like columns. “If you make an altar of stone for Me, you shall not build it of cut stones, for if you wield your tool on it, you will profane it” – Exodus 20:25. If the altar itself were made of stones that were clearly cut, Rohl’s objection may hold more weight. However, the stones in the altar are clearly not cut but were merely moved into the required formation. Lennart Möller, The Exodus Case, 4th ed. (Copenhagen, Denmark: Scandinavia Pub. House, 2010), 305. Charles Whittaker, “The Biblical Significance of Jabal Al Lawz” (Ph.D. diss., Louisiana Baptist University, 2003), 159. Möller, The Exodus Case, 305. Whittaker, The Biblical Significance of Jabal Al Lawz, 162.